Due to the windy weather I had a second night in a guest house. 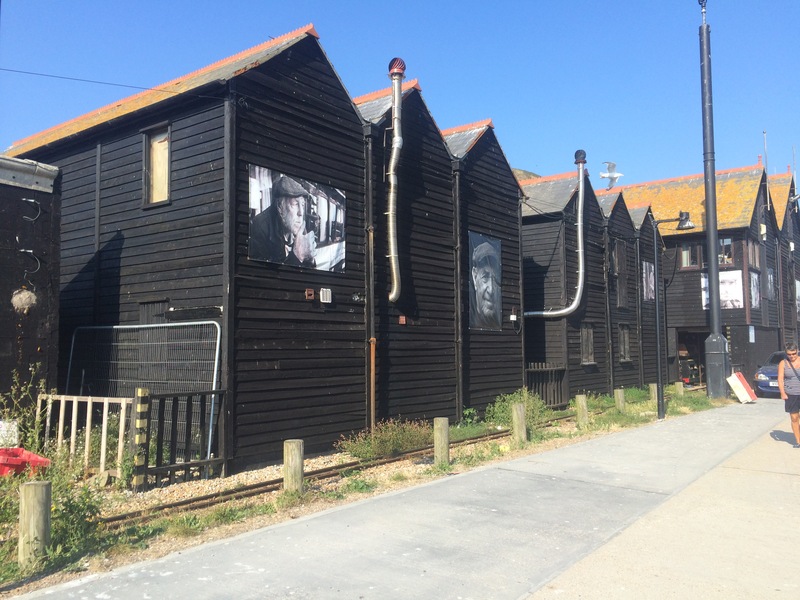 The cheapest one I could find was back in Folkestone so I was back and forth on the train to and from Deal. I had a nice night’s sleep in a clean room and a lovely homemade fish cake for breakfast so all was well. 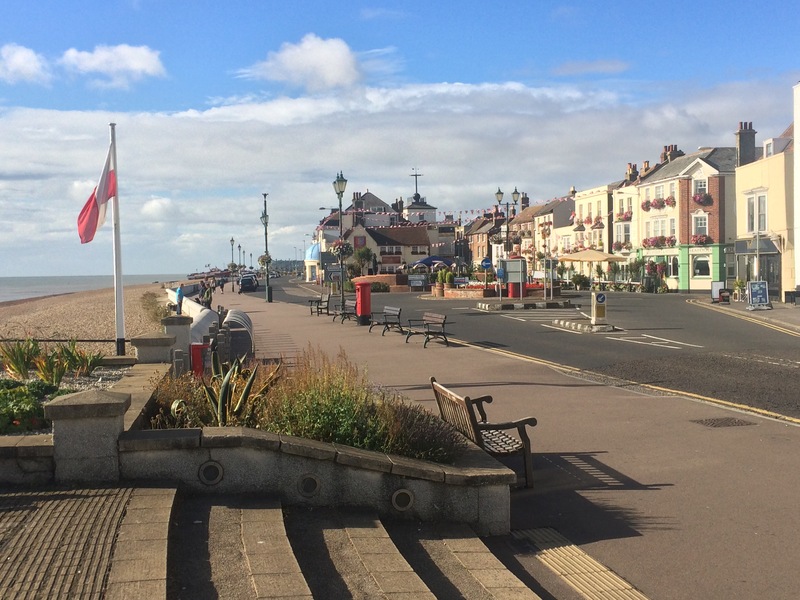 I arrived back in Deal before 9am and set off along the sea front. 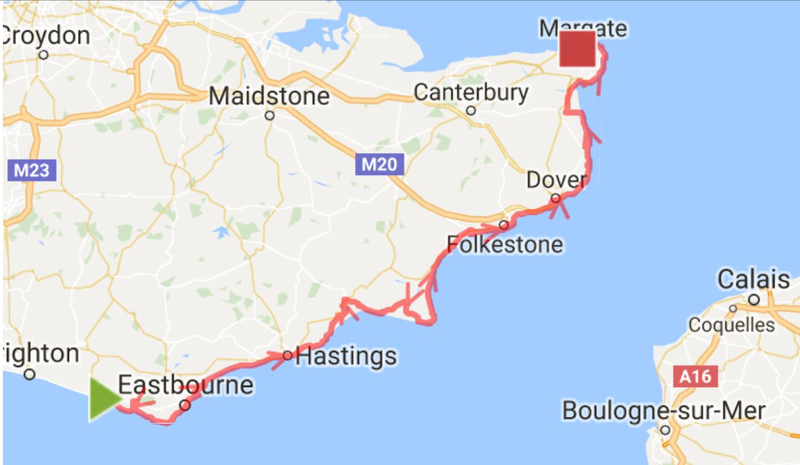 I was still following the Saxon Shore Way, all at sea level, as I walked alongside the Royal Cinque Ports Golf Links as far as the Sandwich Flats. Not far after the rather exclusive-looking Sandwich Bay Estate I turned inland and headed for the town of Sandwich, where I could cross the River Stour. 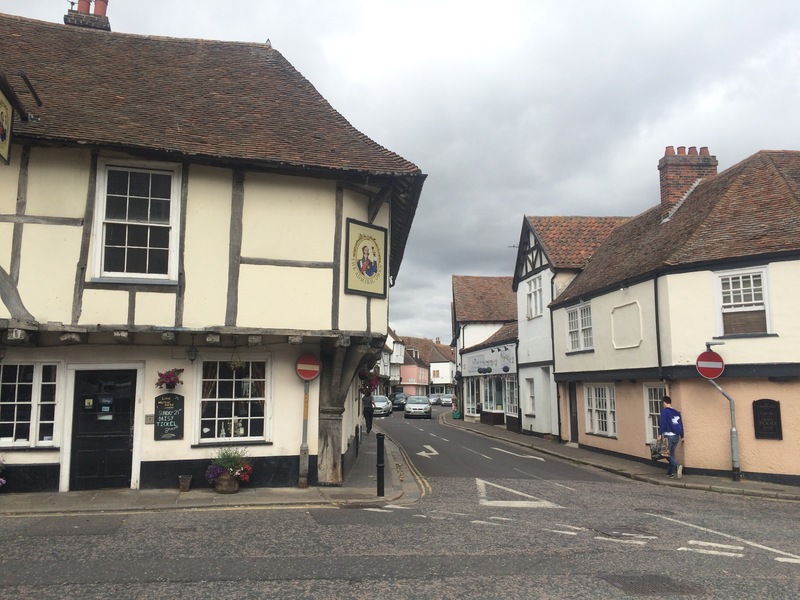 Sandwich seemed rather quaint with its old town, narrow streets and higgledy, piggledy buildings. I decided to stop for a coffee as it was already rather hot and a break inside a cool building was welcome. 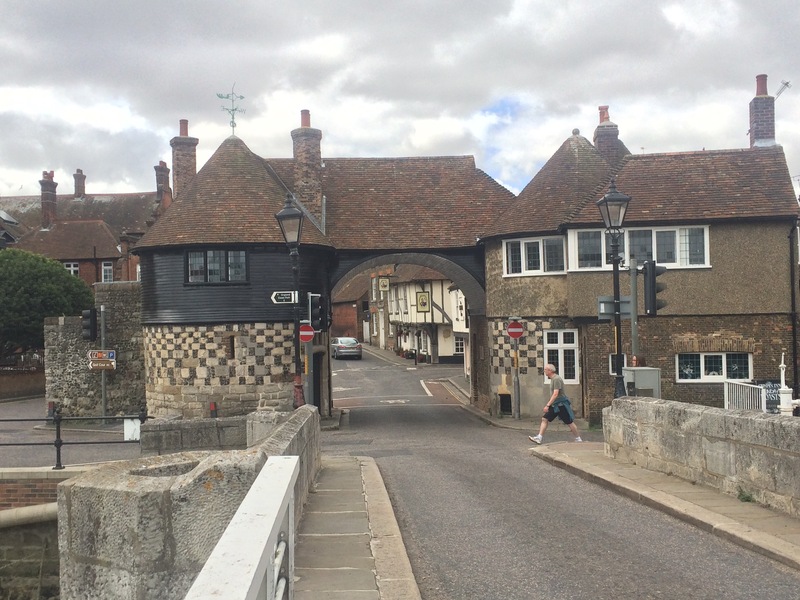 I didn’t see much of the town but I did spot the Fisher Gate, the only remaining Mediaeval town gate that was built in 1385 as part of King Richard III’s town defences. 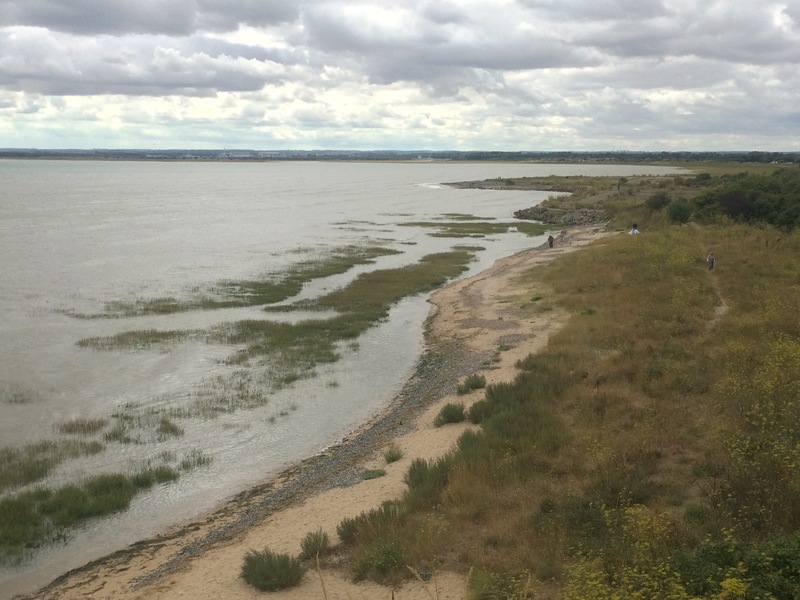 I left Sandwich and had a rather boring walk alongside an industrial estate and the A256 before I found myself in Pegwell Bay Country Park and heading onto the Isle of Thanet. 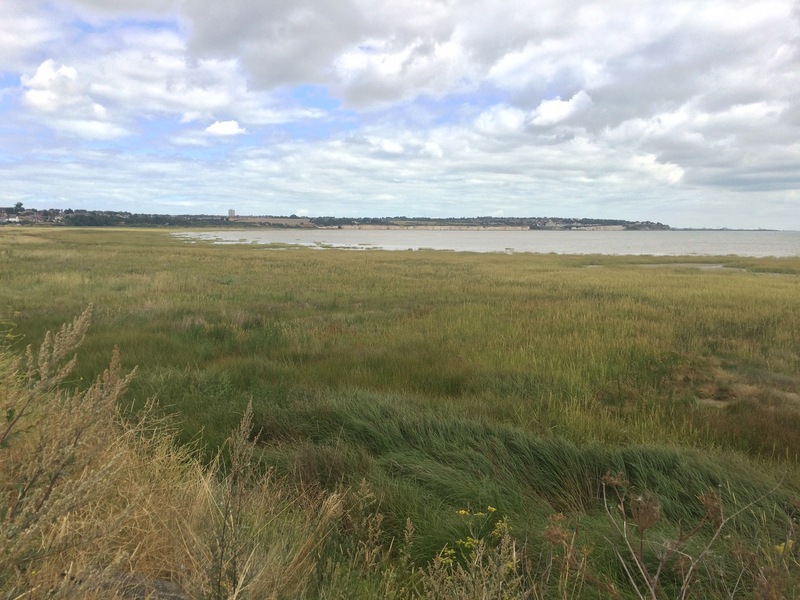 The River Stour flows out into Pegwell Bay, but is connected to the River Wantsum and The North coast of Kent via a series of marshes and levels. 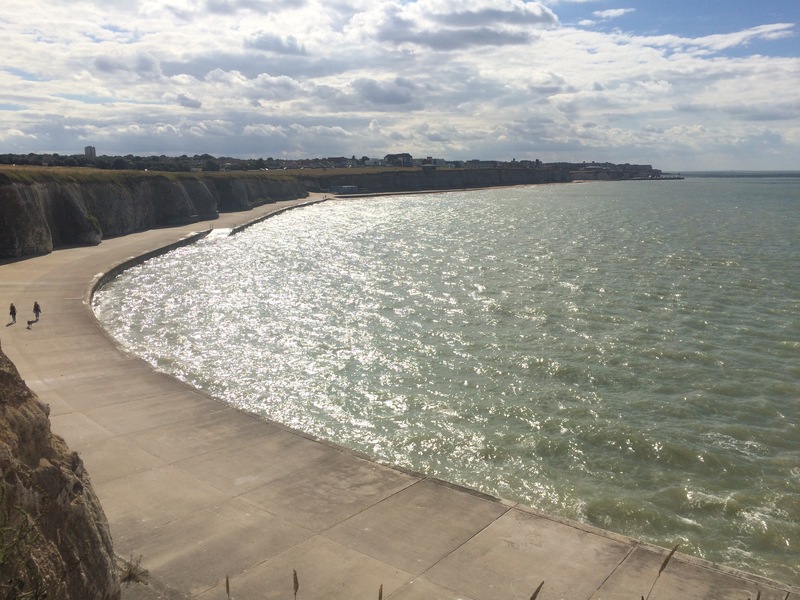 This low lying land was once under the sea and I would have had to get a boat to the Isle of Thanet. By the 16th Century the Wantsum Channel had silted up and so it was drained and turned into farmland. 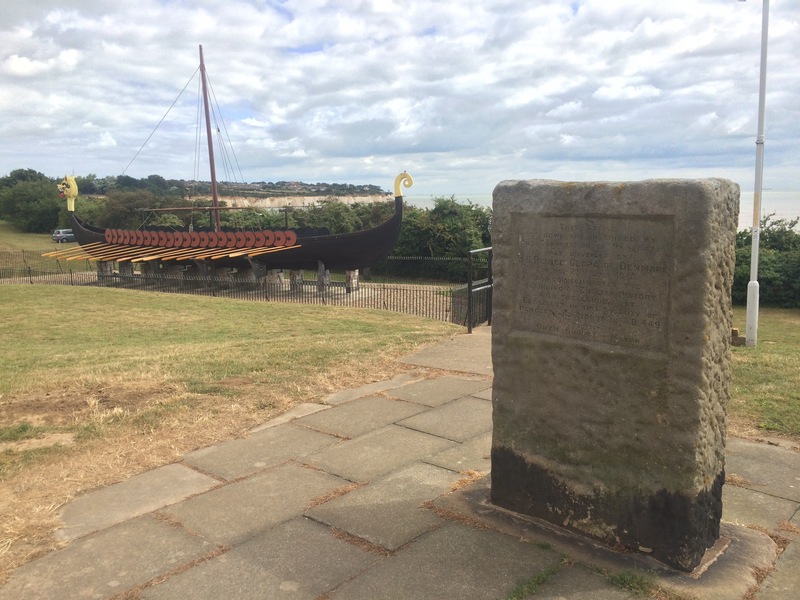 Ebbsfleet is a small settlement overlooking Pegwell Bay and its claim to fame is that this is where the Saxon Warriors Hengest and Horsa are acknowledged to have landed in AD449. According to a commemorative stone, unveiled in 1948 (in time for the 1500-year anniversary) by Prince George of Denmark, this marked the “beginning of English history”, which I thought was rather amusing. 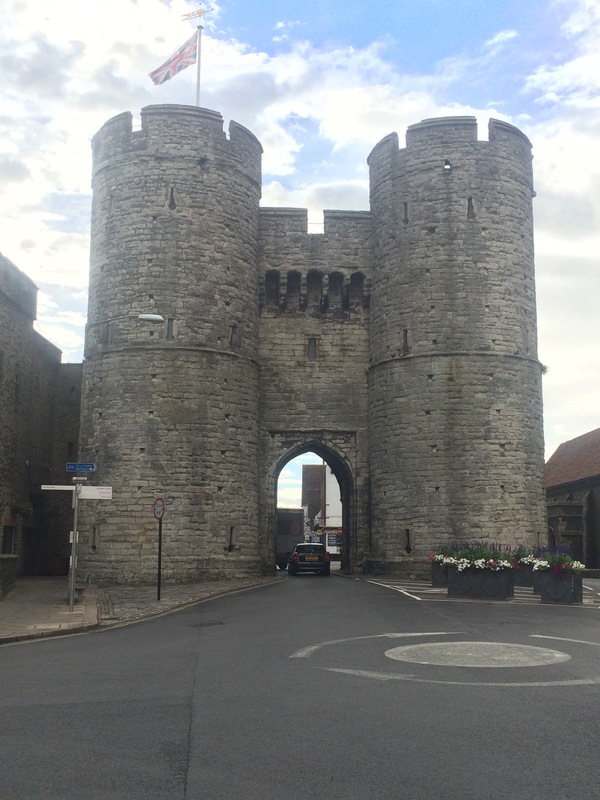 The two warriors were followed in AD597 by St Augustine, a monk sent from Rome to set up a mission in Canterbury and spread Christianity to Southern England. 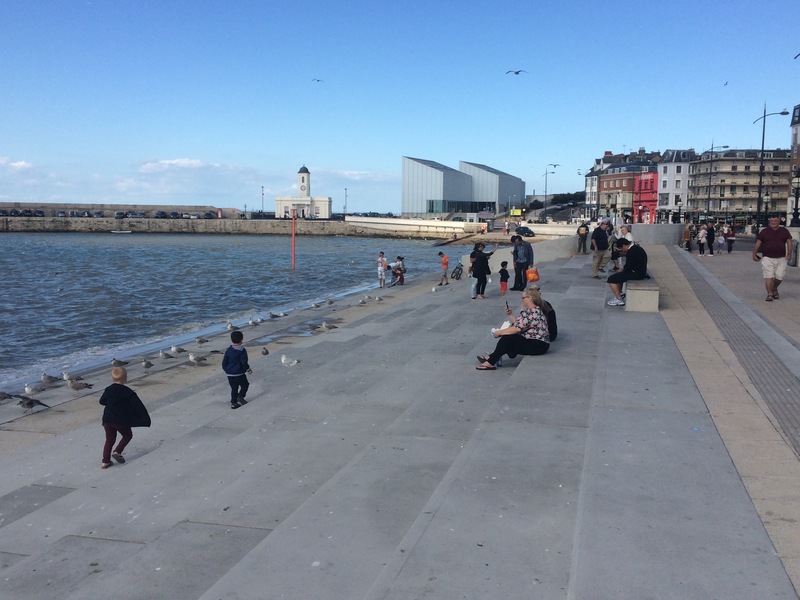 The Thanet coastal path is named the Viking Coastal Trail and begins at a replica of the Viking ship ‘Hugin’ that was sailed from Denmark to Britain by Hengist and Horsa. It seemed that Pegwell Bay’s more recent history was rather less distinguished as in the 19th Century it was where shrimp paste was made. 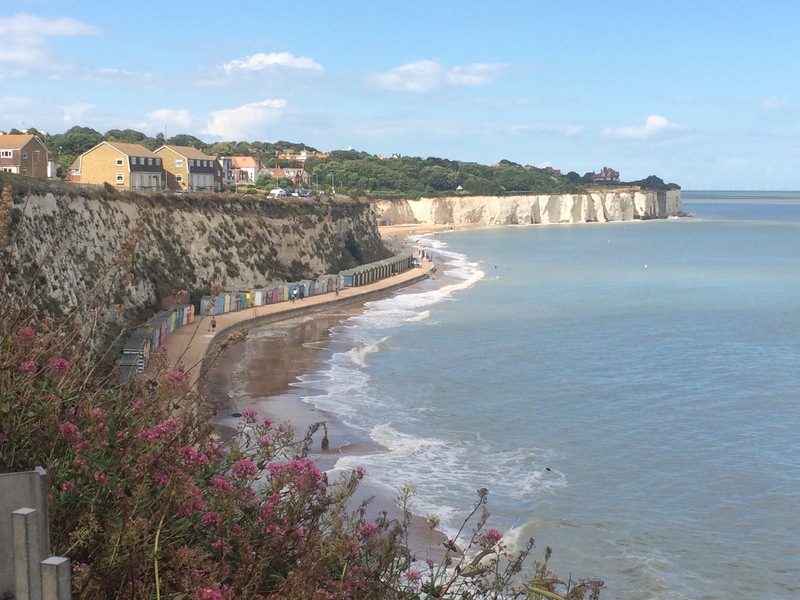 The Isle of Thanet is known for its 3 seaside resort towns of Ramsgate, Broadstairs and Margate. All different and yet the same. 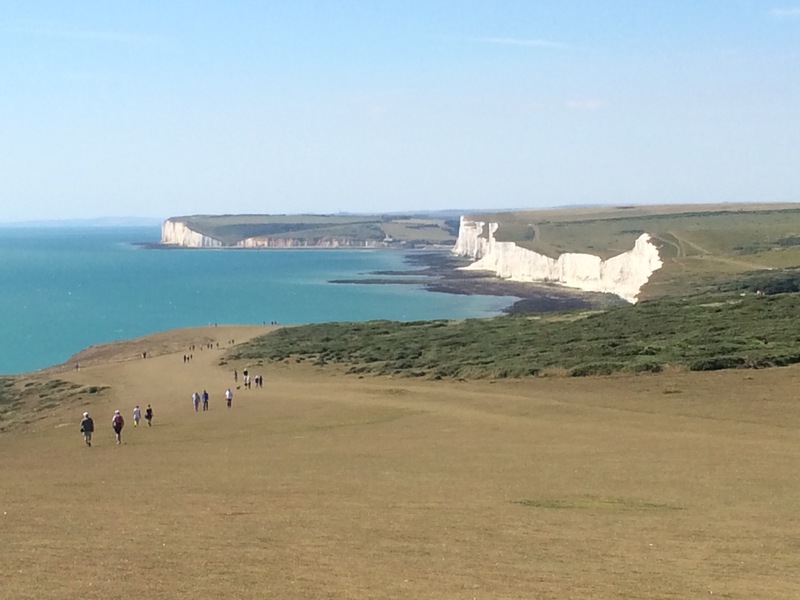 The chalk cliffs rose up again around the Isle, punctuated by yellow sandy beaches. 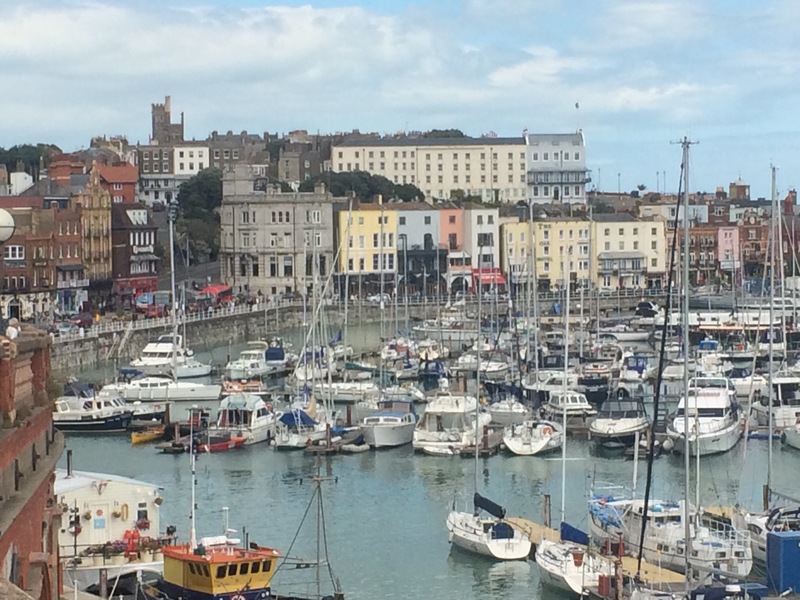 First up was the port of Ramsgate. Approaching West Cliff the town seemed incredibly run down as most of the buildings next to the coast appeared dilapidated. 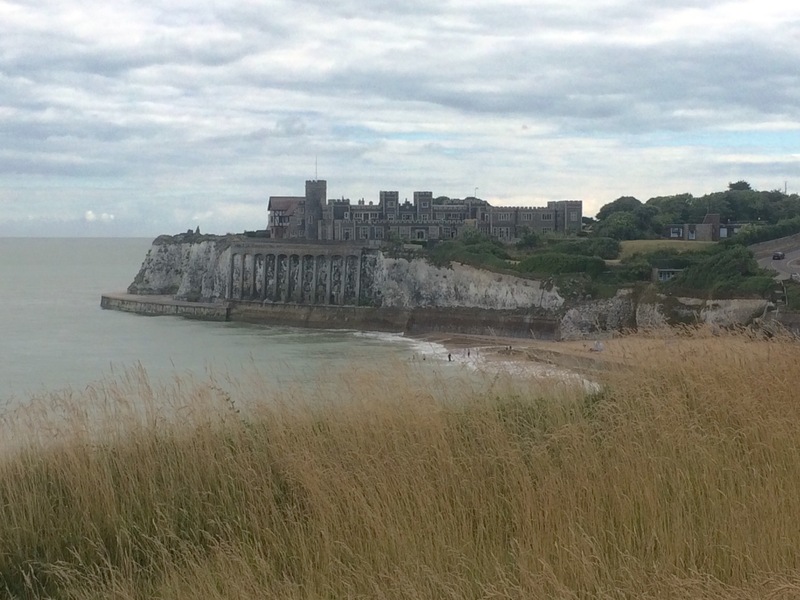 It was quite a sad and depressing sight, but one which improved considerably as I rounded the cliff and overlooked the marina and the main part of town. This was more like it. 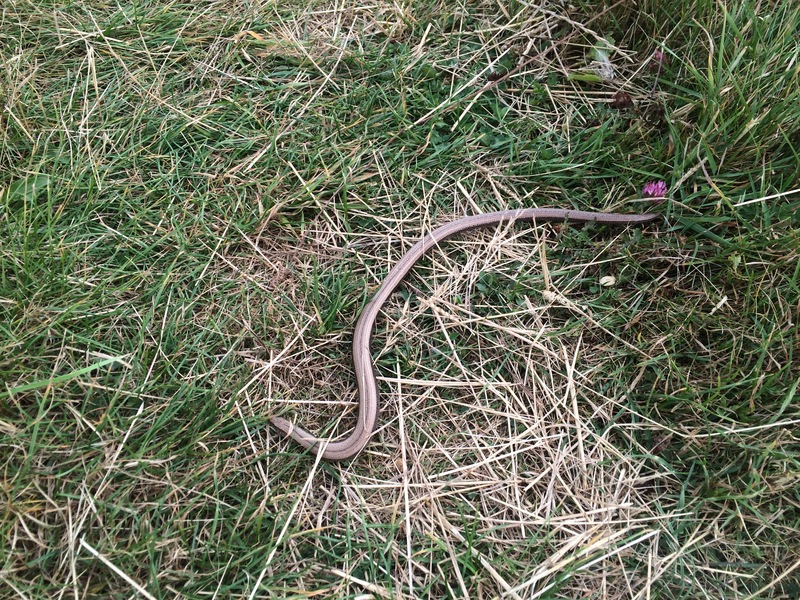 …this one’s in better nick! 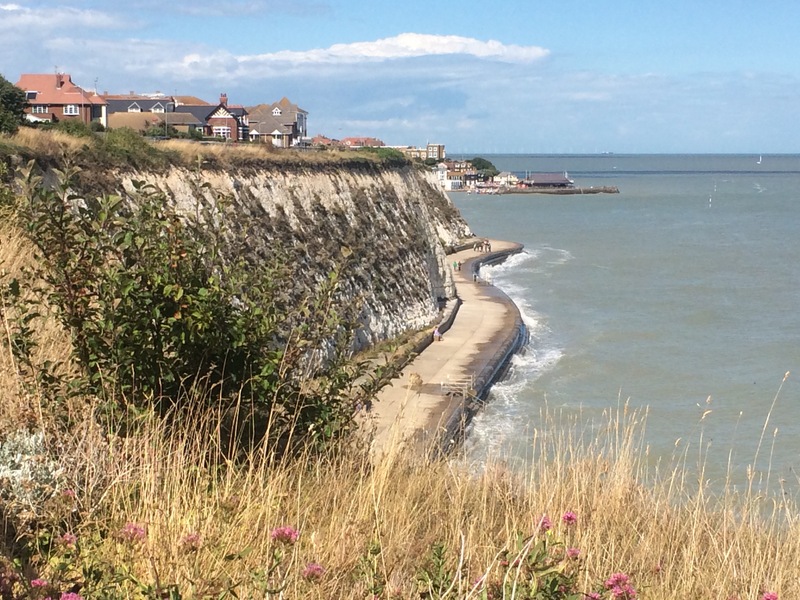 Van Gogh worked in Ramsgate for a year in 1876 and the town is proud of its association with the famous artist. 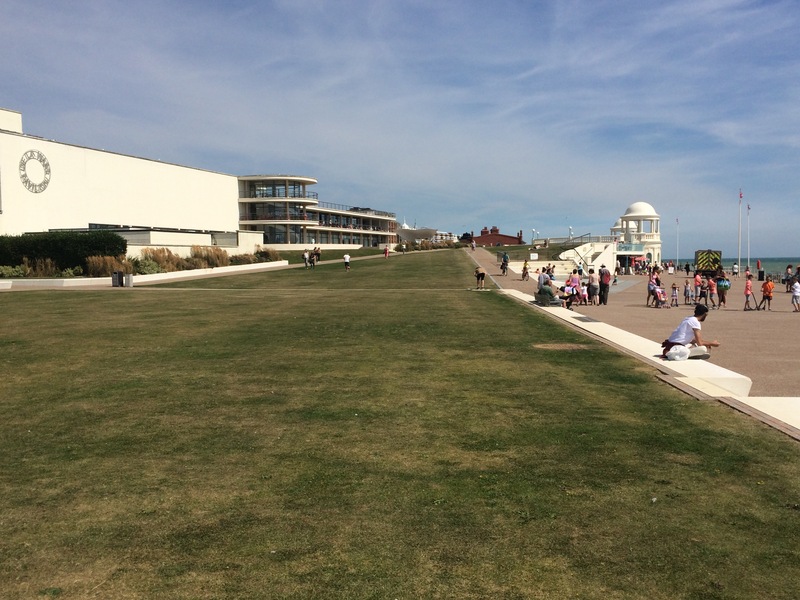 I imagine the town was a lot more vibrant back then and the lovely green spaces on the cliff tops would probably have been buzzing with more people than there were today, enjoying the sea air, a band playing in the shade of the ornate bandstand and possibly strolling around the boating lake. 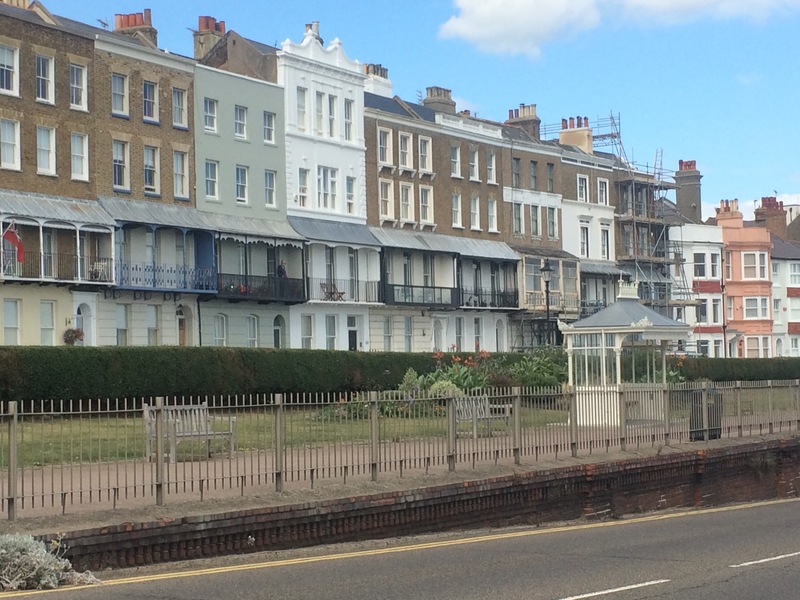 Ramsgate had the feel of a once-genteel place that has fallen on harder times. 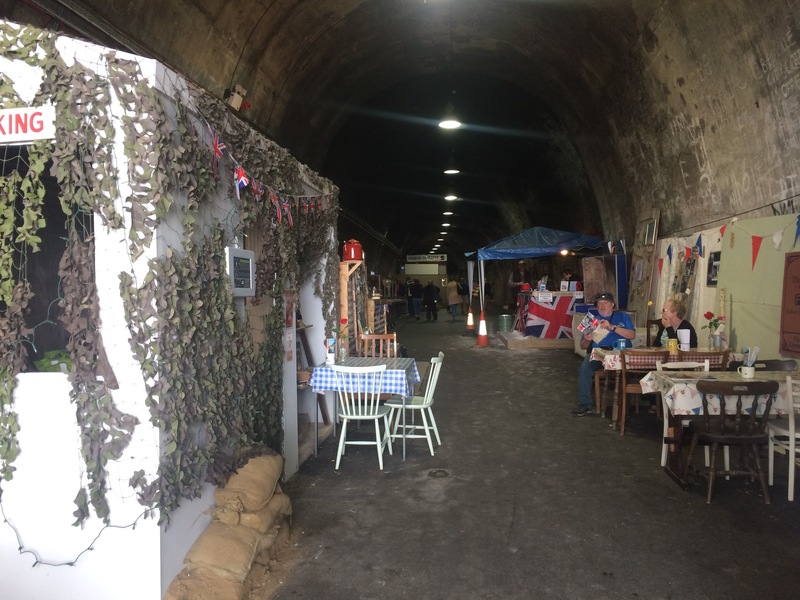 I passed the entrance to the WW2 tunnels; miles of deep shelter tunnels built at the start of WW2 to protect the citizens from air raids. It would have been nice to have stopped but I was on a mission to get to Margate so walked on, past the costumed volunteers. 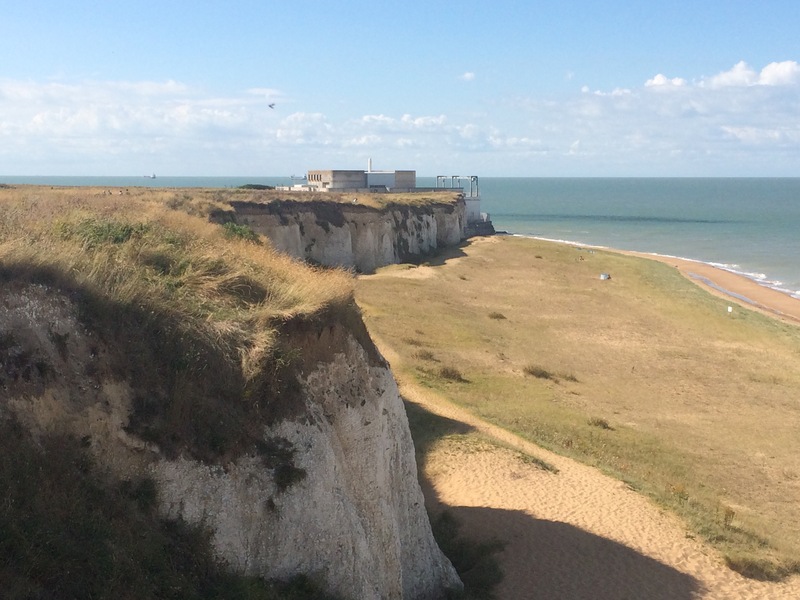 Ramsgate merged into Broadstairs and I kept alternating between walking the cliff top (on the edge of suburbia) and the concrete walkway built at the base of the vertical, chalky cliffs. This was the blandest, smelliest and dullest walkway, which was such a shame. 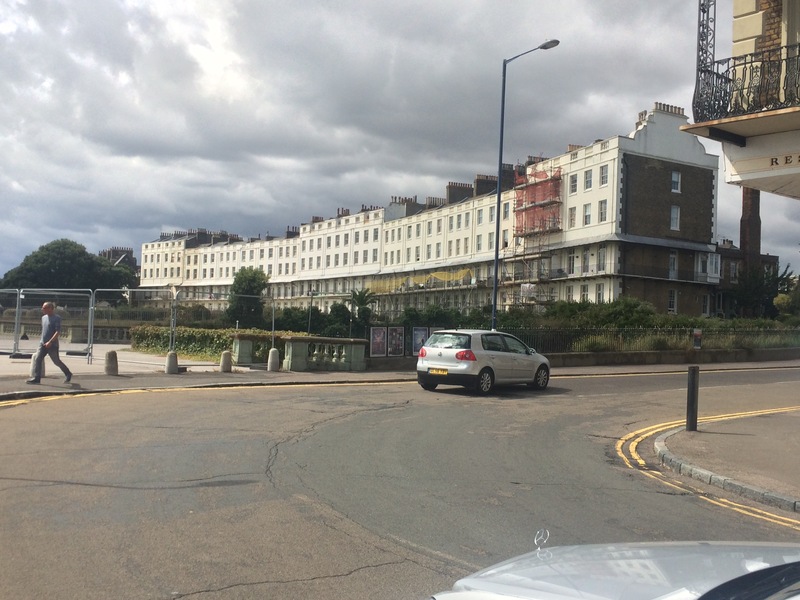 …the section approaching Margate – interminably dull! Perhaps it was just bad timing on my behalf but the weaving coastline and changing tides had trappes tonnes of seaweed that exuded a strong rancid smell akin to that of rotten eggs. There were very few people down at this level and that might also be due to the constant dead ends. Every so often the walkway would just stop and I’d have to retrace my steps to the nearest exit point. 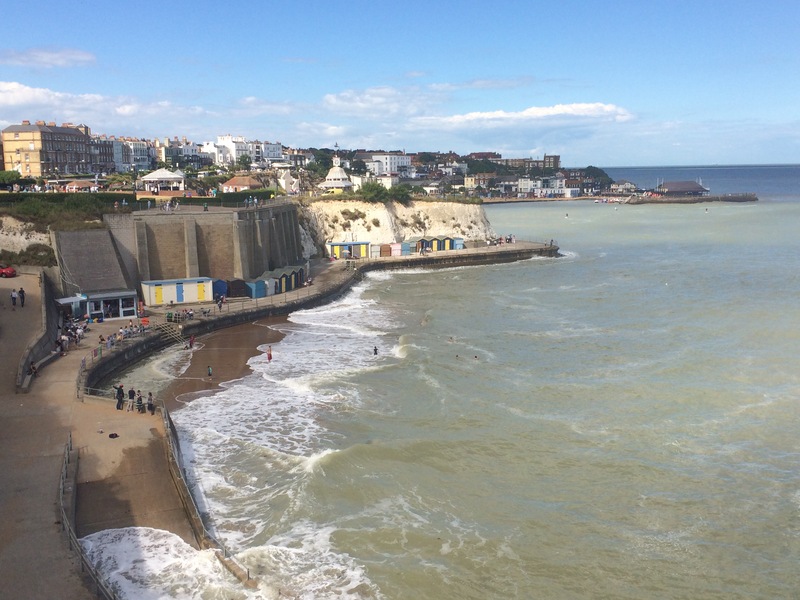 Fortunately there were lots of nice punctuations in the form of the 7 bays of Broadstairs (which are actually the 7 bays around the whole of the Isle of Thanet). 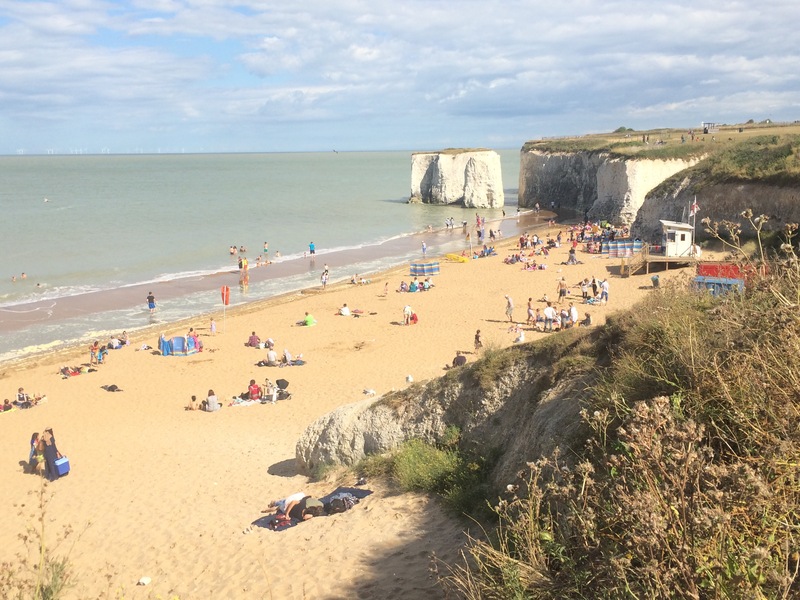 Beautiful golden sandy beaches nestled between white cliffs; proper old-fashioned bucket-and-spade beaches. 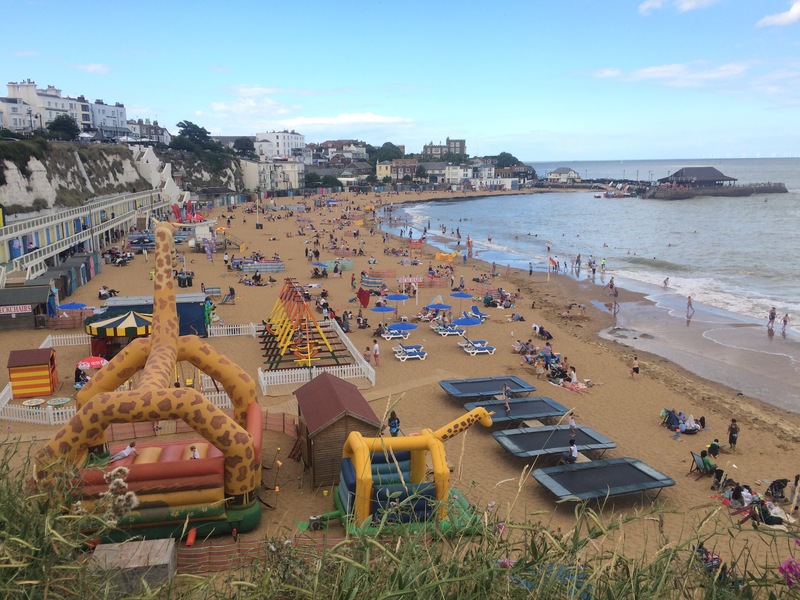 Where Ramsgate had been the scruffy tramp, Broadstairs was the civilised old lady. 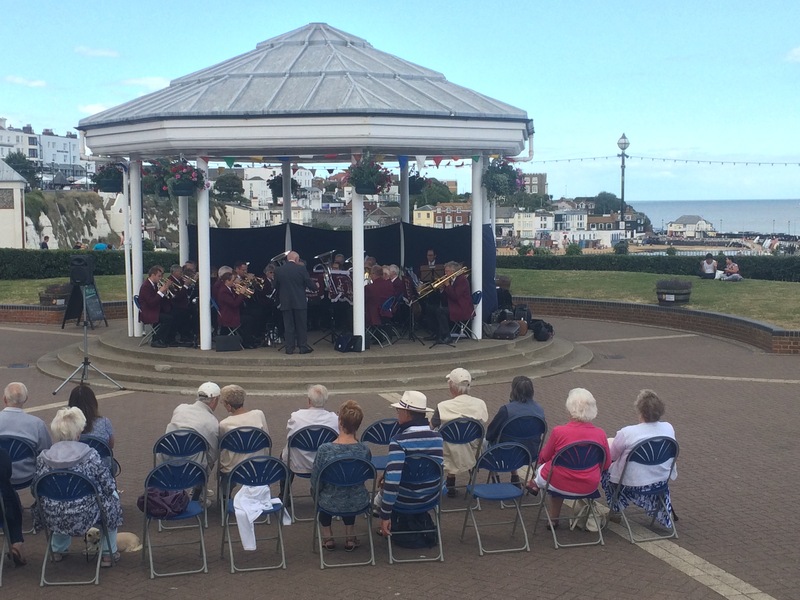 There was even a silver band playing to a silver-haired audience sat around the bandstand. 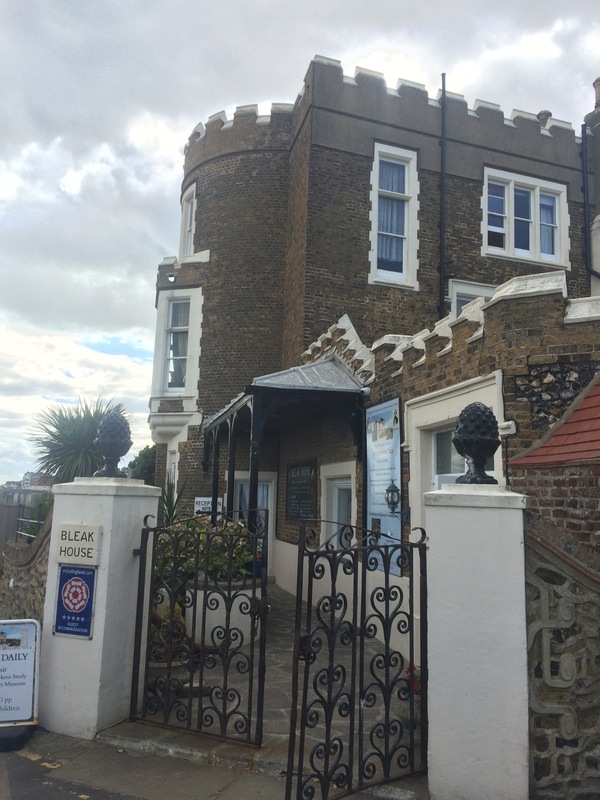 The path took me past Bleak House, which fooled me because I knew that was a Dickens’ novel but I didn’t know it was the name of Dickens’ holiday residence. It turns out that Fort House was renamed Bleak House years later. 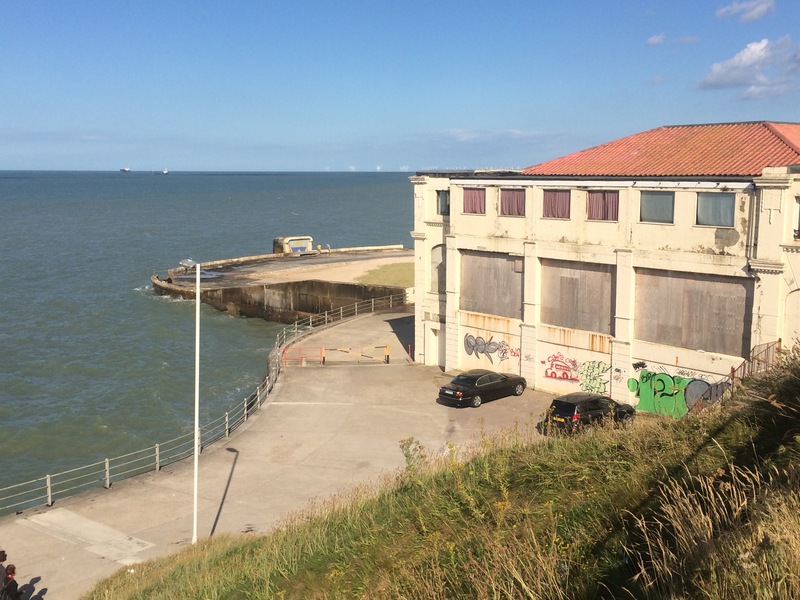 A large and beautiful building overlooking the sea, it did not look bleak to me. 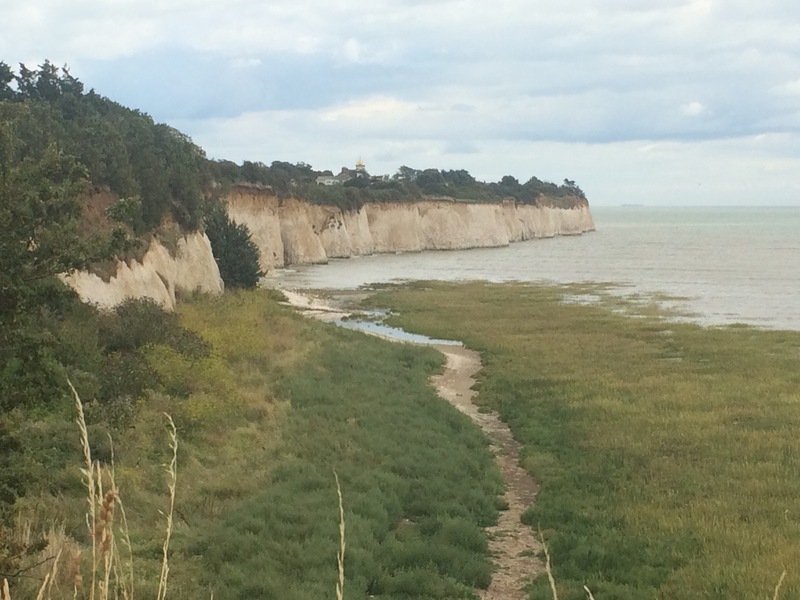 I continued walking North along the top of the chalky cliffs, past the 18th Century Kingsgate Castle and on to Foreness Point. This was where I finally turned my back on France and began heading West, towards London. 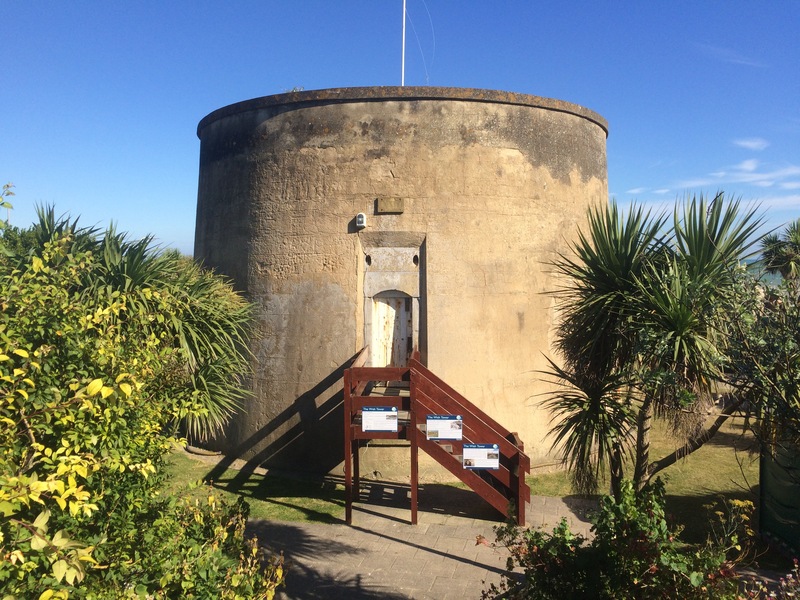 Foreness Point was not large or a significant landmark, merely the site of a wastewater pumping station at the end of a grassed area. 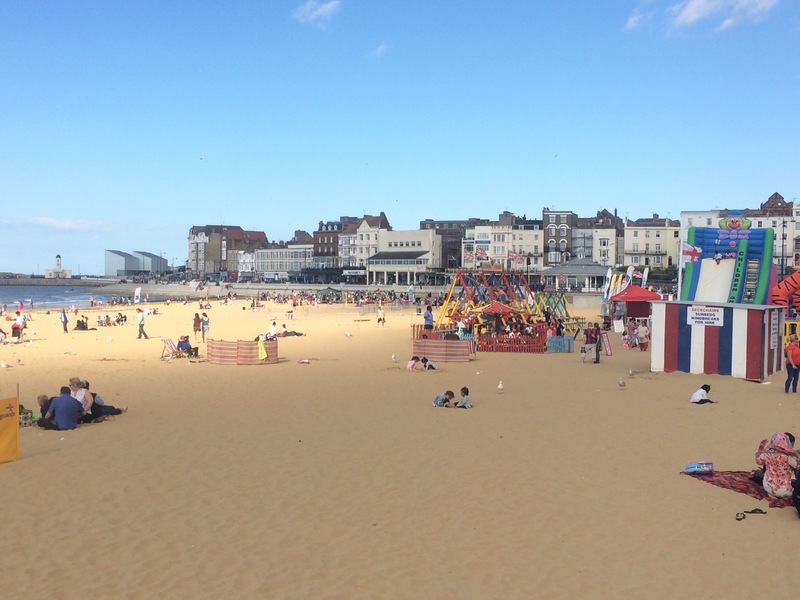 Next stop Margate: the quirky, loud one of the 3 sisterly towns. I walked past the tidal pool at Walpole (somewhere I returned to a few weeks later to go for a swim). It was very large in area and quite at-one with the sea. It was late afternoon and I was tired. 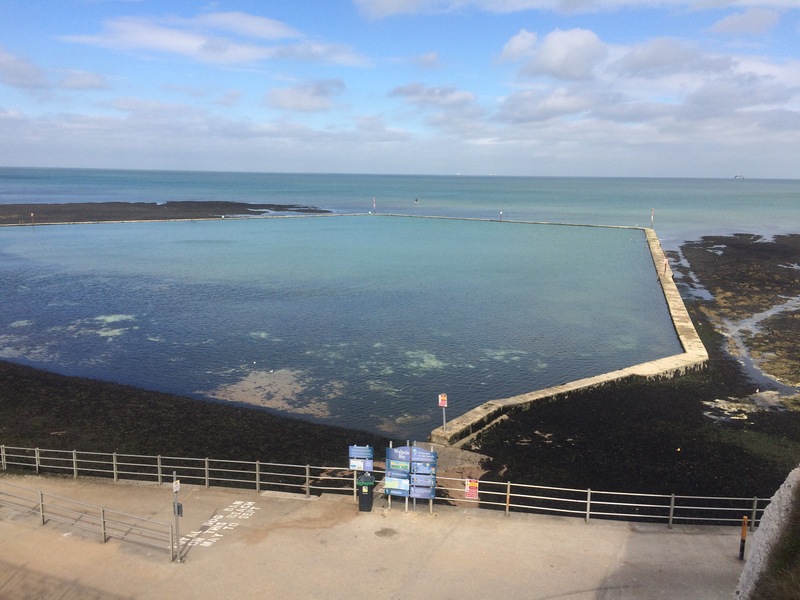 Because of the forecasted windy weather I had booked a night at the youth hostel in Canterbury so I headed rather quickly around the lively seafront and straight to the train station. 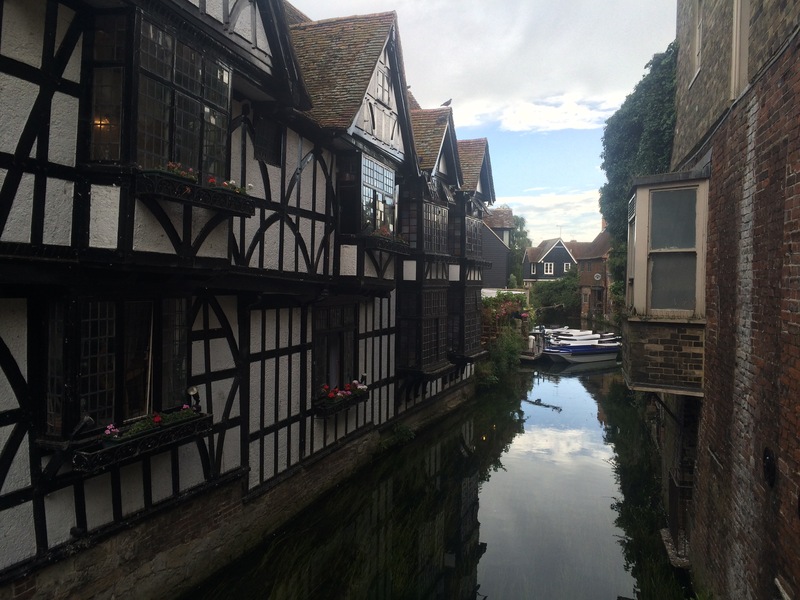 Arriving in Canterbury I still had to walk right through the heart city; little did I know what a treat this would be. Yet again, without even meaning to, I had ended up seeing somewhere really beautiful that was not on my intended path. How lucky I am!